1National Evidence-based Healthcare Collaborating Agency, Seoul, Korea. Received: August 12, 2016; Revised: November 24, 2016; Accepted: January 3, 2017; Published online: March 27, 2017. A number of alternative donor options exist for patients who fail to find domestic HLA-matched donors for allogeneic hematopoietic stem cell transplantation (allo-HSCT). We assessed physicians' perspectives on allo-HSCT donor selection when a matched domestic donor is not available. We administered a questionnaire survey to 55 hematologists (response rate: 28%) who attended the annual spring conference of the Korean Society of Haematology in 2015. The questionnaire contained four clinical allo-HSCT scenarios and the respondents were asked to choose the most preferred donor among the given options. In all four scenarios, the hematologists preferred a matched international donor over partially mismatched unrelated domestic or haplo-matched family donors. The numbers of hematologists who chose a matched international donor (HLA 8/8) in cases of acute myeloid leukemia, chronic myeloid leukemia, acute lymphoblastic leukemia, and aplastic anemia were 37 (67.3%), 41 (74.6%), 33 (60.0%), and 36 (65.5%), respectively. The important factors that affected donor selection included “expecting better clinical outcomes (40.5%)” and “lower risk of side effects (23.4%).” The majority of participants (80%) responded that allo-HSCT guidelines for donor selection customized for the Korean setting are necessary. Although hematologists still prefer perfectly matched foreign donors when a fully matched domestic allo-HSCT donor is not available, we confirmed that there was variation in their responses. For evidence-based clinical practice, it is necessary to provide further comparative clinical evidence on allo-HSCT from haplo-matched family donors and fully matched unrelated international donors. Allogeneic hematopoietic stem-cell transplantation (allo-HSCT) is a rapidly evolving curative option for patients with both non-malignant and malignant hematologic disorders . Traditionally, allo-HSCT requires HLA-locus matched donors, which could be the recipient's sibling or an unrelated volunteer. The outcome of allo-HSCT is best when it is performed using an HLA-identical sibling donor . However, due to incomplete donor availability, allo-HSCT from a matched sibling donor is available for only 30% of patients ; for the remaining 70%, the next-best option is to receive allo-HSCT from an unrelated HLA-matched donor. These donors are available in 50%–90% of cases, varying by country. The probability of finding an unrelated HLA-matched donor depends on many factors including the ethnic homogeneity of the people in the nation and the size of the country's stem cell donor pool. In fact, the feasibility of finding a donor from international donor registries is low, particularly for non-Caucasians ; even if a perfectly matched donor is found, the transplantation cost and time are additional challenges. The Korea Marrow Donor Program (KMDP) reported an estimated 4,458 allo-HSCTs over 10 years, of which 13% (N=592) used donors from abroad. Based on these numbers, transplantation from abroad is limited in Korea. For patients who fail to find HLA-matched allo-HSCT donors domestically, a number of alternative donor options exist: 1) partly mismatched unrelated donors, 2) HLA-matched international volunteer donors, 3) haplo-matched family members, 4) and cord blood. Recently, the development of effective allo-HSCT conditioning regimens and supportive care techniques have dramatically improved the success rates of haplo-HSCT and cord blood HSCT. Hence, it is unclear which alternative donor option is the best for patients. Due to the ethnic homogeneity in Korea, there exists the possibility that allo-HSCT using international matched donors may show inferior outcomes to those of allo-HSCT using fully matched domestic donors. In this context, we investigated physicians' preferences and perceptions regarding donor selection for allo-HSCT. In particular, we focused on the preferences for (or reluctance regarding) international donors given limited options (haploidentical or partly matched domestic donors) and their reasons for their choices. We performed a person-to-person survey to collate physicians' perceptions and preferences regarding allo-HSCT donor selection. The study subjects included hematologists who attended the annual spring conference of the Korean Society of Haematology held on May 29–30 in 2015, and we ultimately analyzed data from 55 of the 195 attendees (board-certified physicians). The questionnaire was composed of two parts (Table 1). The first section was on the general characteristics of the respondents, such as gender and work experience. The second section focused on the participants' preferences in allo-HSCT donor selection when a domestic HLA-matched donor was not available. In brief, the questionnaire contained the following four case scenarios including the health states of the patients: AML, ALL, CML, and aplastic anemia (AA). In each of these scenarios, we provided information about the recipient (age, gender, disease, time at diagnosis, and conditions) and potential alternative donors (ethnicity, nationality, kinship with patient, degree of HLA matching). The respondents were then asked to choose the most preferred donor among the given options and to indicate the reason for their choice. The available donor candidates included a perfectly HLA-matched international donor, a haplo-matched family member, and an unrelated domestic donor with more than one mismatched allele. Additionally, we asked about the physicians' general perceptions regarding allo-HSCT, determinants for donor selection in general, and their references for making their decisions. We performed all statistical analyses using STATA SE 13.0. A total of 55 hematologists participated in this survey (response rate: 28%), of whom 67% (N=37) were male (Table 2). Of the respondents, 65% (N=36) had more than 10 years of experience in hematology and 27% (N=15) had over 20 years. The majority of respondents were working at a university hospital (84%), of whom 31% (N=17) were working at a national university hospital and 53% (N=29) were working at a non-national university hospital. Among hospital locations, the majority of participants (N=42) were working in the capital area (Seoul/Gyeong-gi), while only 24% (N=13) were working in other regions. For the AML case, among the 55 respondents, 67% (N=37) chose a donor from Taiwan whose HLA type perfectly matched that of the recipient; 27% (N=15) chose a haplo-matched family donor, while only 5% (N=3) chose a domestic donor with a partial HLA type match (HLA 6/8; Fig. 1A). The main reason for the donor choice was “expecting better clinical outcomes” (69%, N=38), followed by “shorter waiting time for transplantation” (15%, N=8), “lower risk of rejection” (13%, N=7), and “lower cost for transplantation” (4%, N=2). The most common reason for choosing a fully matched Taiwanese donor was “expecting better clinical outcomes,” while the most common reason for choosing a haplo-matched family donor was “short waiting time for transplantation.” This preference reflects the fact that although a moderate number of physicians chose haplo-HSCT, they generally believe that clinical outcomes will be better with full-matched foreign donors than with haplo-matched family donors. In case 2, 75% of the respondents (N=41) chose a perfect HLA match from Taiwan. Fifteen percent (N=8) preferred an unrelated domestic donor whose HLA type matched partly (HLA 7/8) the recipient's. Eleven percent (N=6) chose a haplo-matched family donor (Fig. 1B). The reasons cited for these donor selections included “better clinical outcomes” (N=39, 70%), “lower risk of rejection” (21%, N=12), “lower cost for transplantation” (5%, N=3,), and “short waiting time for transplantation” (2%, N=1). The most common reason for both choosing a full-matched Taiwanese donor and for choosing a haplo-matched family donor was “expecting better clinical outcomes.” In this case, the time for transplantation was not a great consideration in the choice of donors, reflecting the slow clinical course of CML. In case 3, 60% of the hematologists (N=33) chose an American (Caucasian) donor whose HLA type perfectly matched the recipient's. Sixteen percent (N=9) chose a haplo-matched family donor, and 13% (N=7) chose a partially mismatched (HLA 6/8) unrelated domestic donor (Fig. 1C). The reasons for the donor choices were “better clinical outcomes” (70%, N=39,), “short waiting time to transplantation” (11%, N=6), “lower risk of rejection” (11%, N=6), and “lower cost for transplantation” (7%, N=4). In the last case, 66% (N=36) of the participants chose a Caucasian donor from the United States whose HLA type perfectly matched the recipient's. 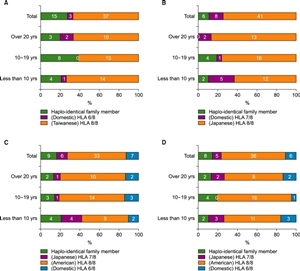 Fifteen percent (N=8) chose a haplo-matched family donor, and 11% (N=6) chose a domestic unrelated donor whose HLA type matched 6/8 alleles (Fig. 1D). More than half of the participants (N=33, 60%) indicated that the reason for their choice was “expecting better clinical outcomes.” Other reasons for the choice of donor included “lower risk of rejection” (27%, N=15), “shorter time to transplantation” (7%, N=4), and “lower cost for transplantation” (4%, N=2). On a questionnaire regarding the determinants of donor selection that allowed for multiple choices, 46% of the physicians responded that the major factor in their donor selection was “better clinical outcomes”; the other factors included “lower risk of side effects” (27%), “condition of recipient” (9%), “national health insurance (NHI) coverage criteria” (12%), and “cost burden to patients” (6%) (Table 3). In response to a question regarding the reference used for decision making in donor selection, 40% (N=23) of the participants cited the “NHI coverage criteria” as their primary reference, 33% (N=19) cited “clinical guidelines,” and 14% (N=8) cited “previous experience with procedures” (Fig. 2). Participants who had completed their hematology certification programs less than 10 years earlier were more likely to consider the clinical outcomes and side effects. 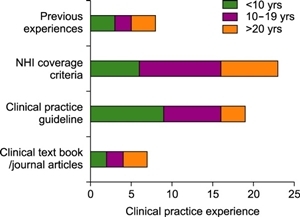 Participants with more clinical practice experience were more likely to consider their individual previous experiences and the NHI coverage criteria than to consider the clinical guidelines (Table 3, Fig. 2). When participants were asked about the need for Korean clinical guidelines regarding donor selection, the vast majority (N=44, 80%) responded that allo-HSCT guidelines for donor selection customized to the Korean setting are necessary (Table 4). Even matched donors from America were overwhelmingly preferred over haplo-matched family donors for CML and AA; the preference was most pronounced in the CML case, followed by the AML case. This phenomenon is interesting because the outcomes with haplo-matched family donors are gradually improving, with some studies reporting outcomes similar to those with matched unrelated donors for haplo-HSCT . The best haplo-HSCT results are being reported in AML patients, with results similar to those of allo-HSCT from matched sibling donors . The preference for haplo-matched family donors was most prevalent in the AML case, followed by the ALL case. This outcome likely reflects the participants' belief in the potential for graft-versus-tumor (GVT) effect in haplo-HSCT . Sufficiently favorable clinical outcomes reported for haplo-HSCT in acute leukemia would also affect participants' decisions. In contrast, the preference for haplo-matched family donors was low in the CML case; this finding is interesting because CML is one of the tumors that may benefit most from GVT following allo-HSCT. We conjecture that sparse data regarding the clinical outcomes of haplo-HSCT in CML are the underlying reason for this outcome, which is also supported by the result observed only in the CML case that haplo-HSCT was not preferred over partially mismatched unrelated HSCT. In 3 of 4 scenarios, the participants showed a slightly higher preference for haplo-matched family donors over partially mismatched unrelated donors, but we could not identify the exact reason for this tendency; we assume that this preference was related to the easy availability of haplo-matched family donors, although the time and costs for transplantation may also explain this preference. In addition, the effectiveness of haplo-matched family transplantation has improved as the risk of potent graft-versus-host disease has decreased due to recent advances in effective conditioning regimens . Although the physicians preferred perfectly HLA-matched donors from other countries on the grounds of better clinical outcomes, the cost of transplantation is another barrier for patients and their families. This is because all the expenses incurred by searching for and identifying matched donors, coupled with the subsequent process to extract and transport the stem cells, are much higher if the cells are donated from other countries. According to 2007 estimates, the cost from the KMDP reported an average estimated cost of KRW 9,020,000 in 2007; in contrast, the costs from the Chinese, Taiwanese, Japanese, and American bone marrow banks were an estimated KRW 32,409,606, 19,320,050, 30,183,600, and 53,932,542, respectively . Adding the cost of the transplantation operation definitely increases the total medical cost for allo-HSCT, and a cancellation fee is also incurred if a patient discontinues the preparation process for transplantation abroad. Therefore, in reality, transplantation from a perfectly matched donor is not always feasible. Despite these interesting findings, this study has a number of limitations. First, the survey subjects were hematologists who attended the Korean Society of Hematology meeting in 2015. Thus, the number of participants surveyed was limited, and caution is required in interpretation. Second, not all of the survey participants worked at hospitals that performed allo-HSCT. In other words, the results of the study were from hematologists in general, not from selected physicians who actually performed allo-HSCT in routine practice; hence, there may be a discrepancy between real-world practice in Korea and the survey outcomes. To our knowledge, this is the first study to explore physicians' perceptions and preferences regarding allo-HSCT donor selection in Korea when full-matched domestic donors are not available, and few similar studies have been performed in Asian countries. The results of this study present an important message to the hematology society in an era in which efficient allo-HSCT techniques are being actively developed in order to utilize various types of donors. The results of the survey show that hematologists in Korea still choose fully matched donors even when they are not available domestically; in fact, from a technical viewpoint, this finding concisely reflects the current situation in the allo-HSCT field, in which the outcomes of allo-HSCT using alternative donors are not established. However, considering 1) the cost and complexity of using international donors and 2) the favorable recent outcomes of haplo-HSCT and cord-blood HSCT, decisions regarding donor selection are likely to change in the near future. Based on our study results, research that compares alternative donors, including international matched donors, are necessary in order to help Korean hematologists to make rational decisions. Further comparative clinical research is necessary to develop customized Korean guidelines for rational alternative donor selection. Results of donor selection by case scenario. (A) Acute myeloid leukemia (AML), (B) Chronic myeloid leukemia (CML), (C) Acute lymphoblastic leukemia (ALL), (D) Aplastic anemia (AA). Reference for donor selection. Multiple choices were not allowed, but two respondents mistakenly gave multiple responses. Description of each case scenario. Necessity of the Korean HSCT guidelines. Krishnamurti, L, Abel, S, Maiers, M, Flesch, S. Availability of unrelated donors for hematopoietic stem cell transplantation for hemoglobinopathies. Bone Marrow Transplant, 2003;31;547-550. Parmar, S, de Lima, M. Hematopoietic stem cell transplantation for myelodysplastic syndrome. Biol Blood Marrow Transplant, 2010;16;S37-S44. Armand, P, Antin, JH. Allogeneic stem cell transplantation for aplastic anemia. Biol Blood Marrow Transplant, 2007;13;505-516. Mahmoud, HK, Elhaddad, AM, Fahmy, OA, et al. Allogeneic hematopoietic stem cell transplantation for non-malignant hematological disorders. J Adv Res, 2015;6;449-458. Spitzer, TR. Haploidentical stem cell transplantation: the always present but overlooked donor. Hematology Am Soc Hematol Educ Program, 2005;2005;390-395. Powles, RL, Morgenstern, GR, Kay, HE, et al. Mismatched family donors for bone-marrow transplantation as treatment for acute leukaemia. Lancet, 1983;1;612-615. Beatty, PG, Clift, RA, Mickelson, EM, et al. Marrow transplantation from related donors other than HLA-identical siblings. N Engl J Med, 1985;313;765-771. Velickovic, ZM, Carter, JM. Feasibility of finding an unrelated bone marrow donor on international registries for New Zealand patients. Bone Marrow Transplant, 1999;23;291-294. Kanakry, CG, Fuchs, EJ, Luznik, L. Modern approaches to HLA-haploidentical blood or marrow transplantation. Nat Rev Clin Oncol, 2016;13;132. Wang, Y, Liu, QF, Xu, LP, et al. Haploidentical vs identical-sibling transplant for AML in remission: a multicenter, prospective study. Blood, 2015;125;3956-3962. Lu, DP, Dong, L, Wu, T, et al. Conditioning including antithymocyte globulin followed by unmanipulated HLA-mismatched/haploidentical blood and marrow transplantation can achieve comparable outcomes with HLA-identical sibling transplantation. Blood, 2006;107;3065-3073. Wang, Y, Liu, DH, Xu, LP, et al. Superior graft-versus-leukemia effect associated with transplantation of haploidentical compared with HLA-identical sibling donor grafts for high-risk acute leukemia: an historic comparison. Biol Blood Marrow Transplant, 2011;17;821-830.